P.S He’s still got a face I want to slap! At a time of miserable conditions for the poor, sick and disabled people, the administration of the welfare state is a disaster. The grand projects the Department for Work and Pensions has launched since the general election have been bureaucratic fantasies and practical catastrophes. Ministers have wasted hundreds of millions of pounds of public money – Tory ministers, mark you, who pose as the defenders of hard-working taxpayers. For all that, Iain Duncan Smith tramps on without a thought of changing his ways: a character study in destructive pig-headedness. At some level, he must know he is failing on all fronts. He and his state-sponsored propagandists pulsate with aggression. Anyone who tries to investigate his department is met with obfuscation and intimidation. Duncan Smith denounced the BBC for publishing a leaked memo, which showed that the costs of his employment and support allowance were growing at a formidable pace. The corporation was a more committed opponent of welfare reform than Labour, he cried (knowing how quickly the BBC folds under accusations of political bias). He hired Richard Caseby, a former executive at Rupert Murdoch’s News UK, as a civil service spin doctor. “That corporate rightwinger is no more a civil servant than I am Miley Cyrus,” I thought at the time. So Caseby proved when he went on to splutter denunciations of the Guardian that had no connection I could see to his new brief or a civil servant’s duty of impartiality. Duncan Smith has targeted the Trussell Trust, an exemplary Anglican charity, which has mobilised the conscience of the nation and fed the hungry. He and his sly ministers suggested that visitors to food banks were freeloaders, rather than victims of poverty and the incompetence of Duncan Smith’s department. As they did it, they were sitting on a government report, which showed the Trussell Trust was right. Low incomes and benefit delays were compelling hundreds of thousands of hungry people to beg for food as a “last resort”, it said. There is a journalistic scandal here. The Mail and the Telegraphattacked New Labour for its manipulation of the media, with considerable justification. But now their friends are playing the same tricks, where are the Paul Dacres and Peter Obornes defending honest reporting from governmental attack? The journalistic scandal hides the greater public scandal. Duncan Smith and his placemen have to intimidate because his department is the administrative equivalent of a failed state, a collapsed institution, where ministers mouth promises that never and can never come true. Earlier this year, with barely concealed incredulity, Nicholas Wikeley, a judge at the Administrative Appeals Chamber, dismissed an attempt by Duncan Smith to keep secret a government report on the risk to public funds and public provision for the needy his vainglorious plans for universal credit could bring. He could see “no support” for Duncan Smith’s argument that the electorate should know nothing about them. Outsiders could see every reason why Duncan Smith would want to censor, however. Only a few thousand people are on a new credit that is meant to cover millions. Its computer systems have failed. About £140m has been thrown away and Margaret Hodge of the public accounts committee expects that many millions more will vanish. The DWP, she said, embarked on a £2.4bn project “with little idea how it was going to work”. It is not only the universal credit. If you think I am being too harsh, the Department for Work and Pensions annual report, published last week, said that Duncan Smith’s Work Programme was “only helping one in 20 recipients of disability benefits find a job”. The public accounts committee said Duncan’s Smith personal independence payments scheme had been “rushed” through and the consequences for terminally ill and disabled people had been “shocking”. Too often you see the sick and the ill-educated being told to log on to computers they don’t have, to fill in forms they can’t understand for IT systems that don’t work. Duncan Smith will not change. He is a neurotic authoritarian who wants to be powerful and expects to be obeyed, while living with the fear that everyone will dismiss him as a clown if he shows the smallest weakness. Those fears were amply realised in 2003. You may have forgotten that Duncan Smith was once leader of the Conservative party and saw himself as a future prime minister. Then his colleagues showed that, while he thought of himself as a statesman, they thought of him as an abject failure, a man who could not distinguish between reality and whatever ideological programme was animating his mind. By the time the Conservative party deposed him, Duncan Smith had barely an ally left. With singleminded fortitude, he rebuilt his career. He presents himself now as a great reforming minister rather than a prime minister, but his vices remain unchanged. Labour politicians tell a story that captures both his vanity and his folly. A few years ago, Duncan Smith met Douglas Alexander, Rachel Reeves and Stephen Timms. He enthused about his belief in a universal credit that would merge taxes and benefits. He would free 6 million people from the poverty traps of welfare dependency and show them that work made them better off. The Labour politicians admitted that universal credit was a fine idea. They had thought about implementing it many times. But you had to merge incompatible IT systems and find a way of updating the information on millions of people so that Whitehall knew almost instantaneously how much they were earning, what taxes they should pay and what benefits they should receive. Reforming a complex system would take years. If Duncan Smith rushed it he would be engaging in the vast and self-defeating social engineering the right accused the utopian left of forcing on the human race. Duncan Smith would have none of it. The technicalities were trifles. All that was needed was the political will. And he, Iain Duncan Smith, the man of destiny, had the will to make it work. “We looked at him as if he was mad,” one of the participants told me. This entry was posted in Uncategorized and tagged benefits, dwp, Iain Duncan Smith, low incomes, Margaret Hodge, Nicholas Wikley, poverty, Public Accounts Committee, Richard Caseby, taxpayers, Trussell trust, Universal Credit, welfare reform. Bookmark the permalink. Why not bash him forever, he deserves it and more, he is an indirect Murderer!!! I’d go further. Iain Duncan Smith is no substance whatsoever. He’s just a hole-in-the-air. just make sure you incapacitate his henchmen first!!! The man is a fruitcake, and as for the rest of them who stand by him, well, the party is falling to bits. He should be put away, in a stark white locked room forever – he’ll still keep reiterating the words and the sentences that he has been doing for the last 4 years – he will never change and his mental illness does need treating. I am seriously stating that as his mental state is there for everyone to see. He believes that he is doing God’s work, that he is a God and that by starving people, indirectly killing people and wanting rid of anyone who is not working, be they unable to do so or due to the fact that there are no jobs, counts for nothing. The masses at the bottom should go, one way or another. Lets have a little quiz shall we? Read the link below and then count how many of the signs are exhibited by IDS! It would be interesting to know what a good psychiatrist would make of his hatred of people A) he doesn’t know and B) those have nothing, not even good health. 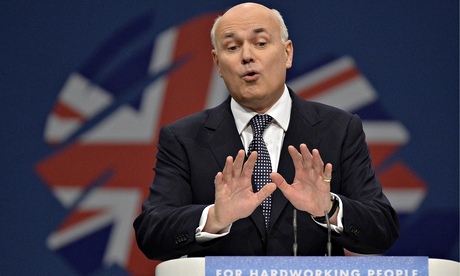 IDS, has the face that keeps on giving. You could never tire of slapping it! IDS is a psychopath , liar , cheat and blot upon humanity. Other than that he is loved by millions . Millions of pounds that is. These people – Smith, Gove, May, Hague, Clegg, Osborne, Cameron, et. al. – know exactly what they are doing. The need for austerity has been laid down for over 40 years; ever since Thatcher in the UK and Regan in the US gained power. Over that period of time, less and less of economic power has been “awarded” to the working class while more and more economic power has been “granted” by the state to the richest, wealthiest and most powerful in our societies. These apparent “bungles” which usually end up with hundreds of millions of pounds spent on IT systems being apparently “wasted” are actually a device to ensure that powerful companies end up receiving huge sums of public funding from tax payers – and deliver nothing in return. The tax payers’ money received by these companies will end up being recycled back into the Tory party so that they can out-spend all the other poliitical parties combined at general elections. PFIs and similar so-called public-private funding schemes for public services vastly enrich many consortia, including private equity organisations which do not have any legal liability to provide publicly available financial records, which then use that money to fund governments which allow them to substantially under-pay their tax liabilities. By constantly changing the state systems used to deliver public services, it makes it impossible to carry out any logical comparison between those different systems and the outcomes they achieve. That way, people like Smith and his conspirators-in-government are able to bamboozle the public with the active support of the mass media and the supine support of the opposition parties. Ultimately, all this is designed to take Britain “back to the future”, i.e. to see a social restoration of Britain back to the kind of society we saw in the past. I believe the faster growth in employment today is in the new “servant” classes. We are even seeing some reversion back to forms of slavery in Britian today. Churches doling out charity will eventually become the main source of social welfare support as the state gradually withdraws completely from any form of welfare provision. The NHS is being allowed to collapse so that their costs can be transferred back to the private sector, where people will have to adjust back to the kind of system in which individuals’ healthcare provision will be linked to their personal wealth. When Neil Kinnock warned people not to be old or sick he was actually talking about today. Why is he still in parliament? He has spent the money that should spent on public services on his own vanity projects, hoping he derive some kind of fame from it. It isn’t right if he wasted that kind of money in a business he would have been sacked long ago. Y’know Maria, I’ve often posed that same question to myself and the only conclusion I can come to is that he MUST have something on CaMORON and GIDIOT Osborne… and/or they are going to use him as the fall guy when it all goes T**TS UP! He is only doing what they have all agreed to. They are deliberately running down public services, cutting state budgets and ushering in a new era reminiscent of 100 years ago. This trend has been going on for 40 years and is designed to ensure that working class people never again have the democratic power to dictate to their social superiors. This present government is the most elitist since the Macmillan government of the 1950s. Is it any wonder they are so keen to see a return back to their “good ol’ days”? But he is not the only one in the present cabinet, or the previous cabinet, for that matter. Tony Blair certainly would be behind bars if the international judicial system had the guts to prosecute him for the crimes against humanity he helped initiate. Those crimes led to the deaths of over a million, and the injury of many more. They are responsible still killing innocents in the Middle East and elsewhere..
@Bryan Hemming. I am sure I’ve read somewhere that politics attracts a higher number than any other profession of sociopaths and narcissists. Kick him out of politics all together and send him over to either Australia or New Zealand. … as tempting as that is George; my Auntie Isobel lives in Australia, I couldn’t do that to her! I just would like to know what he has on “”Cameron” as in any job or place of employment where an employee squandered millions of pounds on Idiotic Ideas that have absolutely no chance of working and still press on regardless would at the very least be sacked and if truth be known IDS should be charged with murder or at least manslaughter due to the premature deaths caused by Esther Mcvey and Ian Dimwit Smiths policies to deprive the most vulnerable people in our society !! You’re saying what every sane and sensible person is saying David. Excellent description of why IDS most definitely is not the political titan he thinks he is. As for his psychology, the Lovelywibblywobblyoldlady points out that he is a clinical narcissist, while Bryan Hemming concludes that he is a psychopath. He is absolutely right. IDS clearly sees people as nothing more than instruments he can use, and has absolutely no remorse for the suffering he inflicts. I therefore recommend that broadcasters play ‘Murder Ballads’ by Nick Cave and the Bad Seeds whenever he comes on. Especially the bit about people being a ‘cog in the wheel of a machine he directs with his red right hand’.